Website editor’s note: One of the many concerning aspects of 5G is that not only would the wireless industry like to install “small cells’ that produce millimetre wave radiation every 150 metres or so in urban areas, there are also companies that want to beam 5G frequencies to earth from space. Even New Zealand, with its tiny (by world standards) population of four million people is potentially in the firing line for this sort of space-based 5G irradiation with Elon Musk’s SpaceX providing a submission to the 2018 consultation* on 5G. Based on Australian research about the adverse impacts on birds and bats living in a nature reserve in which a variety of wireless transmitters have been sited, the increase in artificial electromagnetic radiation from planned 5G system potentially potentially poses a threat to the natural world as well as human health. 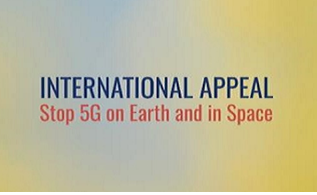 Below is the text of a recent email from Arthur Furstenberg from the Cellular Phone Taskforce requesting that representatives environmental organisations, doctors and scientists sign an International Appeal to Stop 5G on Earth and in Space. Today we are launching an International Appeal to Stop 5G on Earth and in Space. The Appeal, together with the list of signatories, will be formally presented to the United Nations, World Health Organization, European Union, and world governments on or before November 1, 2018. Scientists from each continent who have agreed to be initial signatories are listed below. This email is being sent to 2,400 scientists, doctors and environmental organizations in 90 countries, as well as to people on the Cellular Phone Task Force email list. If you are a scientist, doctor, health professional, building biologist, or other professional or consultant, or if you represent an environmental organization, please sign the Appeal. With your help, stopping 5G is possible. Information about signing the Appeal is provided at the end of this email. The rollout of 5G is a planetary emergency. Technical standards for terrestrial and satellite 5G networks were released in June 2018. Commercial 5G networks are already in place in parts of Estonia, Finland and Qatar, and trials of 5G are underway in China and South Africa. Stopping 5G will put large investments at risk. Governments are therefore unlikely to act without a strong, detailed, unequivocal, united statement led by scientists, doctors and environmental organizations. We are speaking for humanity and the Earth in demanding that the world’s governments take immediate, affirmative action to prevent imminent, serious and widespread harm. Welcome to the website of New Zealand’s 5G information campaign. Thank you for reading this post. If you found it to be interesting, please share it with your friends and family. If you are specifically interested in 5G in New Zealand, please click HERE to visit the page of our site that gives an overview of the situation to date.